summer. in. lilly. - bitte.und.danke. It's not every day that I wear a Lilly Pulitzer skirt (aka, close to never), but that's exactly what I sported during a casual outing a few weeks ago. To be honest, when I first purchased this skirt on sale last summer, I wasn't exactly sure how to style it. I mean, the fluorescent floral print by itself can be downright intimidating. Add in the wrong top and you have a potential fashion fiasco at your hands. And, we all know that no one wants that! Ultimately, I opted to take a back-to-basics approach by pairing my pretty floral number with a white tee. Simple really does it. In true "me" fashion, I went a step further and knotted my t-shirt for a slightly more pulled-together look. 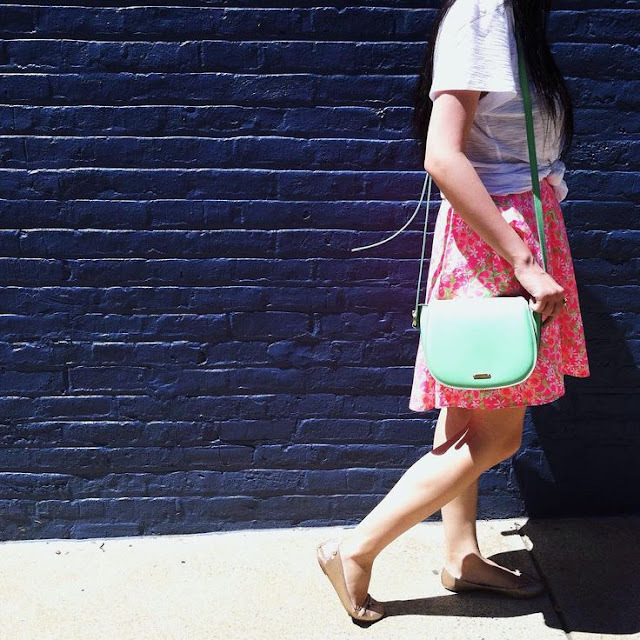 To complement my easy-going #ootd, I accessorized with a high-shine, seafoam green crossbody bag, mirrored aviators, and sparkly ballerinas to boot. The result was a #winning look — not only was this an uber girly + fun outfit to wear on a hot summer day, but the compliments kept on coming too! What's your favorite way to wear a white t-shirt? Are there any winning combos that you swear by? Let me know in the comments below! Cute! You should enter my Instagram contest on Back to School Fashion! I'd love to see your post!